The east end was the fashionable part of medieval Bologna, and remains so today. So different was this aristocratic corner from the more plebeian San Felice district (west of Via Marconi) that to Dante in the 1300s the people seemed to speak two different languages. 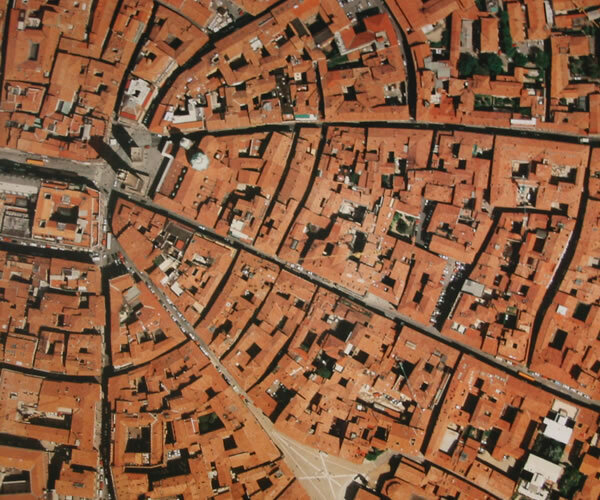 The radial street north of the Strada Maggiore, Via San Vitale, was in the Middle Ages called Via Salaria, the ‘salt road’, along which that commodity was brought from the salt pans along the Adriatic. Its monuments are two fine palaces of the 16th century. First comes the Palazzo Fantuzzi (1538). With its distinctive rusticated columns, this one may be the work of Peruzzi or Serlio (or Andrea da Formigine, no one knows). The elephants carved on the facade are there to remind us that the original name of the family that built it was Elefantuzzi. These pachyderms were so powerful they got to demolish the portico on the street to make their palace bigger, something that still rankles the democratically-minded Bolognesi, 500 years later. 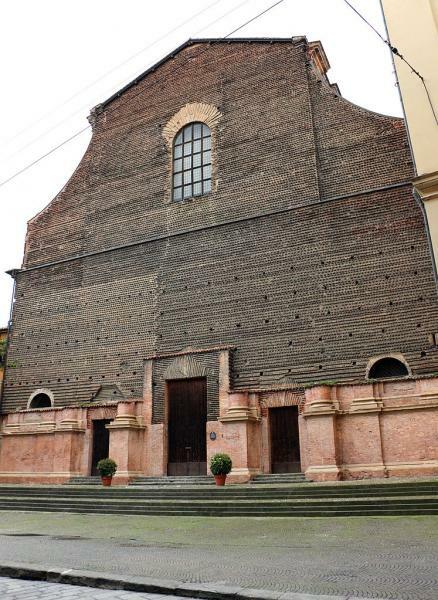 Across the street is SS Vitale e Agricola in Arena was built to honour two early Bologna martyrs who met their end in the city's amphitheatre, which stood on this site. Next comes the Casa Franchini, built in the 1500's incorporating a medieval tower that spans the street, the Voltone di San Vitale. This relentlessly straight street gives itself away as the urban stretch of the old Roman Via Aemilia, Starting from the Two Towers it passes the Renaissance portico of Santi Bartolomeo e Gaetano. There's plenty of interesting Renaissance and Gothic detail on the buildings that follow. At no. 26 is the Casa Rossini, the house that Gioacchino Rossini (the richest composer of his day) commissioned for himself, covered in music-themed reliefs and Latin verses. At no. 34 the porticos hide the entrance to the Torre Oseletti, stronghold to a particularly quarrelsome family, and confiscated by the comune soon after it was built. Across from the the Casa Rossini stands a rare, stout-timbered medieval relic, the 12th-century Casa Isolani, which leads to a delightful medieval covered street full of shops and cafes; on the other side is Piazza Santo Stefano. At Piazza Aldovrandi, the narrow Strada opens up just a little to display the Palazzo Davia-Bargellini with its 'giant' telamones, now the home of the Museo Civico d’Arte Industriale, and across from it the beautiful portico and piazzetta of Santa Maria dei Servi. This street begins with another taste of medieval Bologna, in the picturesque Piazza della Mercanzia. 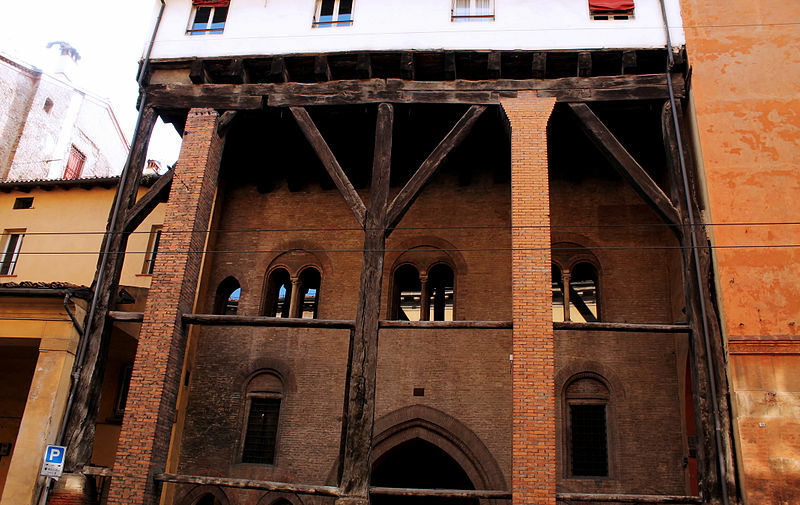 Here, the Gothic Palazzo della Mercanzia is headquarters for Bologna's businessmen today just as it was in the 14th century. Some of the surrounding buildings are even older, including the 1278 Torre Alberici. Continuing down Via Santo Stefano, the Palazzo Bolognini (1517) is a palazzo senatorio, as the Bolognesi call their most impressive palaces, designed for the 'senatorial' class of the most powerful families. This one is known for its graceful portico, decorated with a series of busts in between the arches, some by Alfonso Lombardi. Everything above that level is a 19th-century restoration. Here the street opens into Piazza Santo Stefano, with the remarkable complex of Santo Stefano, reproducing the 'Seven Churches' of Jerusalem. Across the Piazza is the entrance to the Corte Isolani (see above). Behind Santo Stefano the street turns into a pedestrian area; where it meets Via Farini a passage to the south leads to an interesting church full of art, hidden away on its own piazza, San Giovanni in Monte. From here it's a pleasant stroll past more palaces, including another palazzo senatorio at no. 43, the 1566 Palazzo Vizzani-Sanguinetti, now part of the University, and at no. 56, the Palazzo Zani. This is one of Bologna's treasures that few ever get to see, though it's full of art including quadratura ceilings and frescoes by Guido Reni. It is currently the home of the Consorzio della Bonifica Renana, the agency in charge of managing the water in the Reno valley; ask at the tourist office for the infrequent guided tours. Heading due south from the Two Towers, this winding and aristocratic street follows the course of a now-buried canal. The most important among many palaces is the Palazzo Pepoli Campogrande, with its Baroque frescoes and gallery of paintings. 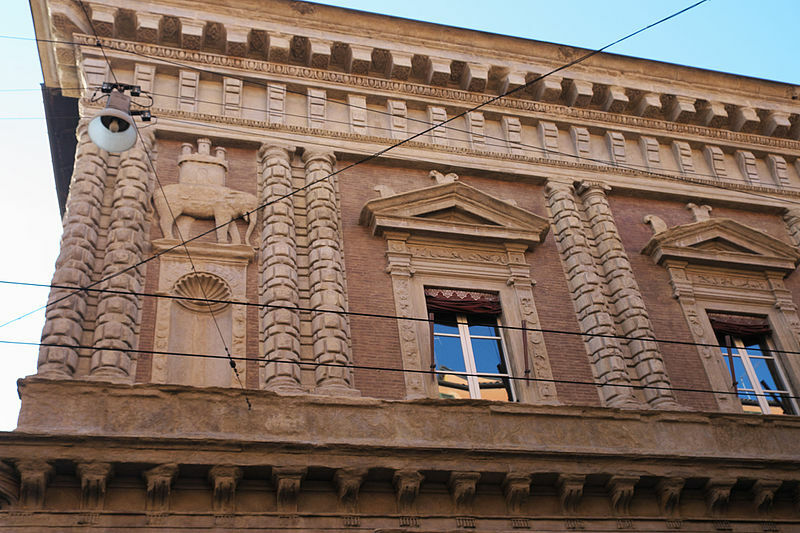 Just south of that is the elegant 1876 building of the Cassa di Risparmio bank. 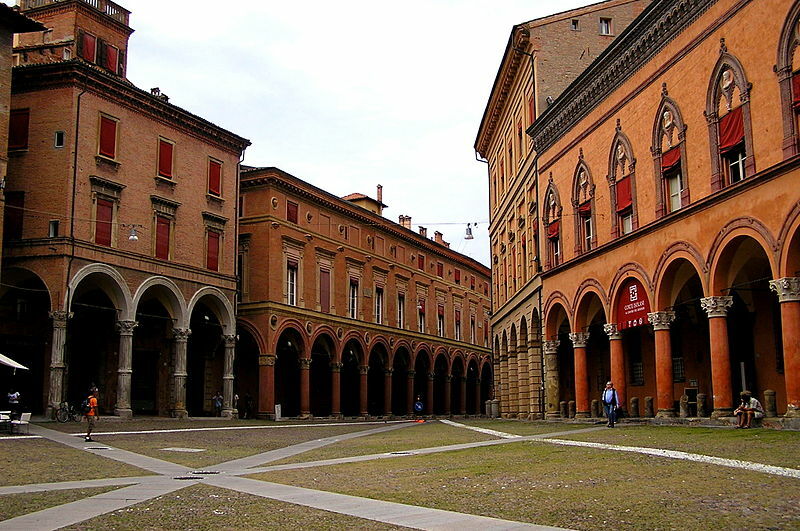 More palaces follow, with some fine architectural details, along with the church of Santa Lucia, a miniature San Petronio with its hideously rugged, never-finished facade; now it is the assembly hall of the University. Beyond that Via Castiglione passes underneath the arch of a medieval tower and into domestic tranquillity.